The police department over in Logiton needs your help — so Coach Newton has kept the relay problem easier this week to leave time for your law enforcement activities. Left: Chris stole the Trophy and my sibling in the middle is completely innocent. Middle: Either Dana committed an unrelated crime, or my sibling who hasn’t spoken yet is named Elliot. Right: At least one of my other two siblings is completely innocent. Interrogator: That’s not much to go on. You in the middle, you’ve gotta give me more to work with, or this is gonna be a long night. Middle: OK, I’ll tell you: Elliot stole the Trophy! Right: And he tried to finger Chris, besides. Remember that in Logiton, anyone who’s ever committed any crime always lies, and anyone completely innocent always tells the truth. And don’t put it past the suspects to use their own names to try to throw you off the scent. Can you figure out the names of any of the triplets? Do you know whether any of them stole the Trophy? And can you establish any of them as innocent? What is the common ratio of the geometric sequence? Windows on the World. The answer to this problem is still embargoed for the relay! Hex Truss. The key fact you need in dealing with these joint-and-beam structures is that if there are J joints, then there must be at least 3J – 6 beams in order for the structure to be rigid. Why is that? Imagine a new joint not connected with anything. It could be anywhere: any height, any position left-to-right, any position front-to-back. So it has three independent ways it can change, or what are called three degrees of freedom. On the other hand, connecting up one beam between two joints constrains just one length to equal the length of that beam, so adding one beam to a structure can reduce the degrees of freedom by at most one. (It might not reduce the degrees of freedom at all, if the two nodes connected already had to be separated by the length of that beam as the structure moves, because of all of the other beams. In other words, a beam can be redundant from the point of view of trying to ensure rigidity.) For the entire structure to be rigid, it needs to get down from the 3J degrees of freedom of J completely unconnected joints to the number of degrees of freedom of a single rigid body, which is 6: three sliding motions (up/down, left/right, and back/forth) and three rotations (around three perpendicular axes). So there must be 3J – 6 beams, at least. Looking at Tamara’s desired base for her structure, it starts with six joints and six beams, so by the formula, it is at least six beams short of rigidity. But all of Tamara’s beams are the same unit length, so we can only add beams between joints that are that unit distance apart. 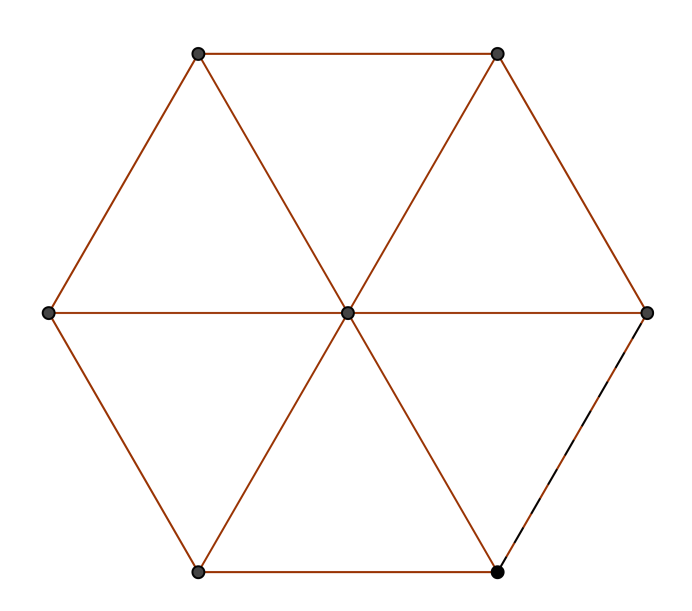 And in the regular hexagon, there are no other pairs of joints one unit apart (see diagram at right). So Tamara will need to add more joints, hopefully at points that are one unit away from multiple existing joints. Remember, each new joint adds three degrees of freedom, so we will have to add at least three beams just to keep the number of degrees of freedom from increasing, and more than three beams to make headway toward rigidity. 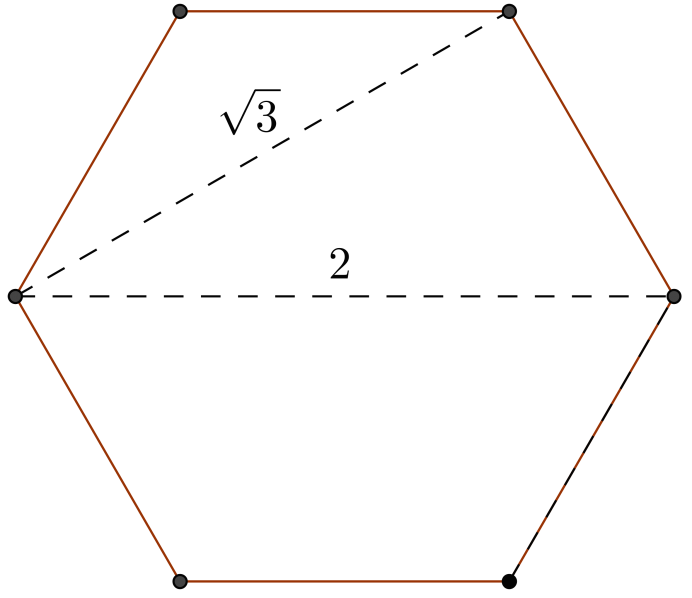 With this in mind, it becomes obvious that Tamara should add a joint at the center of the hexagon. That point is one unit away from all six of the original joints, so she can add six more beams (see diagram at left). Could it be rigid yet? No, because now there are seven joints, so we need at least 15 beams to achieve rigidity. Now the effort becomes finding the minimum number of additional points to place joints to be able to add enough beams of unit length. 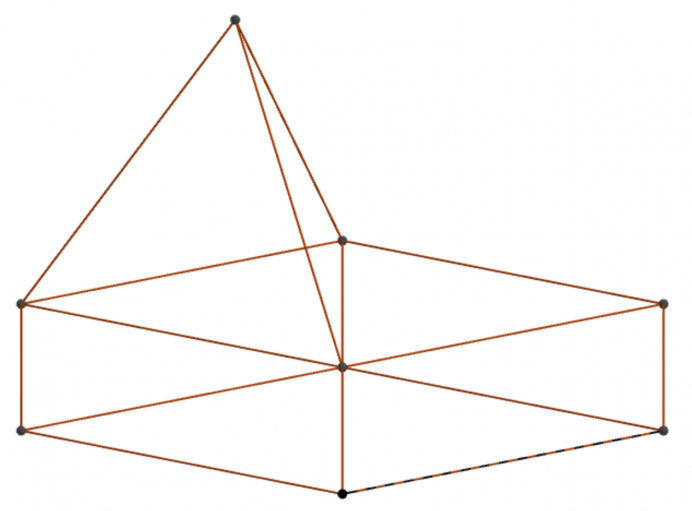 With one more joint, you can get at most three more beams, by placing it at the apex of a triangular pyramid with one of the existing triangles as base (see left diagram, below). With two more joints, you can make another pyramid, and the two new joints happen to be exactly one unit apart (see center diagram, below). But it’s still not quite enough beams: there are now nine joints, but only 19 beams – two shy of a shot at rigidity. 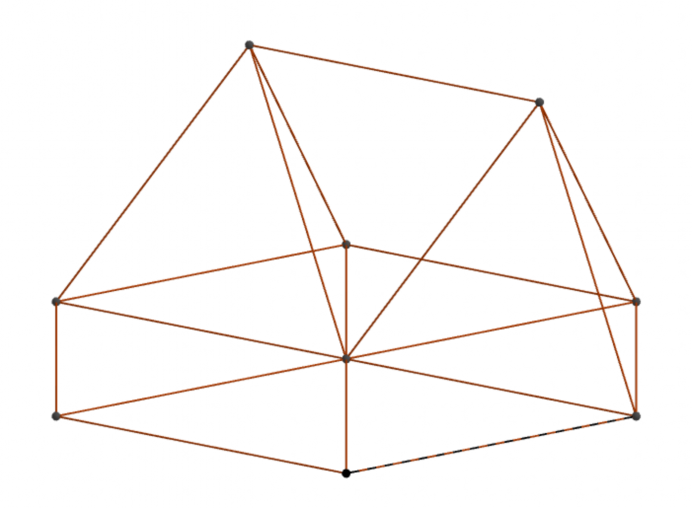 Finally, with three more joints, you can make three pyramids, and the three joints make an equilateral triangle with side equal to the beam length (see right diagram, below). Now there’s a chance: ten joints and 24 beams meets the minimum threshold for possible rigidity. We need to check if this structure is rigid; if it is, we’re done. But at this point, rigidity is pretty clear. 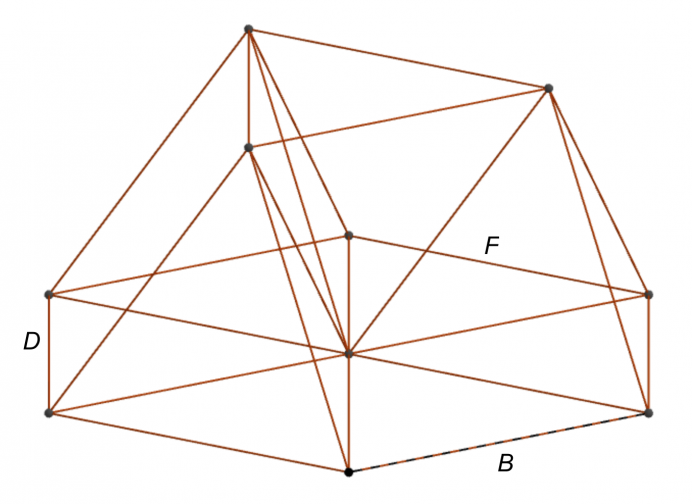 Each of the four regular triangular pyramids in the structure is rigid, so they could only swing around their shared edges, but the three beams from the original hexagon (labeled B, D, and F) which connect pairs of pyramids prevent that swinging from happening. Looking over this structure, we had to add 18 additional beams to the original six of the hexagon to achieve rigidity.